A saint is someone who is in heaven someone that allowed the grace of God to invade him/her. This grace doesn’t compromise or undermine what it invades, it enhances. That is the nature of grace, if we cooperate with God’s grace, we’ll experience life to the fullest. Fr. Barron suggests that a saint is someone that allowed Jesus to get into his/her boat. To see this dynamic at play, just examine the lives of the saints. Fr. Barron explores the lives of 4 relatively speaking modern saints. We can see how Jesus graciously invaded their lives and with their cooperation transfigured them from the inside out. Two of them are dear to my Carmelite heart: St. Therese of Lisieux, and Edit Stein who became St. Teresa Benedicta of the Cross. I identify somewhat with Edith in that it was the great Teresa of Jesus (of Avila) that enkindled in her desire for Carmel. Thomas Aquinas’ sister once asked him what she had to do to be a saint. He said “Will IT”! He is right. Part of our problem is that we accept a kind of spiritual mediocrity. Me a saint … really? Really! A big part of it is to want it, to move beyond the spiritual mediocrity and say I want to be a person of heroic virtue and follow Christ with all my heart and stop playing the game of false humility by saying “I can never do that”. No, for God all things are possible and He can make a saint out of any of us but we have to desire it and cooperate with Him. Katherine Drexel. She came from one of the riches families in the USA. 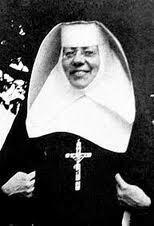 Born 11/26/1 858, her parents were devout Catholics. They had a chapel in their home and her father retired to it for prayer every day after work and did works of charity. They drilled into their children that their wealth had been entrusted to them and was destined to be used for the common good. At 14 years old, Katherine met Fr. O’Connor who had a tremendous influence on her. Under his direction, she laid out a program to grow in holiness. At age 20 her parents died within months of each other and Katherine inherited the equivalent of $400 million today. She was plagued with a sense of anxiety and indecisiveness. During a trip to Europe, she had a meeting with the Pope and kneeling in front of him offered her support to the order of priests or nuns he wished to send to evangelize the Native Americans and the colored people, the most disadvantaged groups in the US. The Pope suggested she should be that missionary. Visibly affected, she left the Vatican and sobbed as she thought of the enormity of such a task. She felt God was calling her to be a nun and perhaps form an order dedicated to the poorest ones in America. She fully dedicated herself and used her money for her tremendous mission. It was justice elevated, transfigured, rendered luminescent by grace. With Katherine’s cooperation, Jesus had so seized her life that now she had become an icon of His Presence. She died in 1955. Thérèse of Lisieux. Born in 1/2/1873, her parents were pious devout members of the French middle class. She had a blissful childhood until her mother died in 1877 when Therese was 4 years old. When miraculously cured from a psychological and physical illness, Thérèse saw it as a manifestation of God’s grace, God’s unmerited love. She would become one of the doctors of grace in our church. She understood clearly that grace was necessary for the spiritual life and this grace required our cooperation with God’s love. She became a Carmelite nun at the age of 15 after begging those in authority, including the Pope, to enter at such a young age. She lived 9 years in the Carmelite convent until her death at age 24 and during this time she developed a spirituality known as the little way which she was ordered to write by her spiritual director in her autobiography the Story of a Soul. Her Little Way involved doing simple and ordinary things out of great love, small sacrifices accepted gratefully. Thérèse was plagued at the end of her life with the darkness of unbelief to join in the pain of so many souls that did not believe in God. She wrote that in a joyful Easter, Jesus helped her understand that there are souls who have no faith. He allowed her soul to be invaded by the thickest darkness and she interpreted this struggle as a participation in the pain of so many of her contemporaries who no longer believe in God. She died of tuberculosis on 9/30/1897 at age 24. Hardly known by anyone at her death, she became known worldwide within a few years of her death due to her autobiography of “Story of a Soul”. We can characterize her holiness as transfigured prudence which was elevated by Christ’s love. 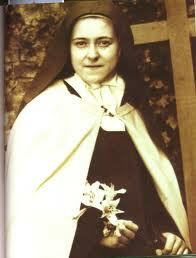 Like a little child, Thérèse let God pick her up and raise her to the heights. Her loving and trusting “little way” allowed her to open herself fully to the grace of God. Edith Stein was born 10/12/1891 in Breslau in Poland to pious Jewish parents. She also had a privileged childhood. She was smart and strong willed. Her father died when she was still young and as she grew older she became an atheist. Highly intellectual, s he studied for a doctorate under Husserl the master of phenomenology. Upon obtaining the doctorate in 1915, Husserl asked her to work alongside him but treated her as glorified secretary leaving her highly dissatisfied with her job. Her friends were scandalized that someone of her great intellect was forced to perform such simple tasks. During this time a good friend was killed in the war and she went to visit his widow, expecting to see her devastated but instead she was sad but fundamentally at peace. That serenity came from the woman’s Christian faith. 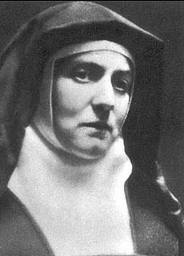 Edith later wrote: “It was my first encounter with the cross and the divine power it bestows upon those who carry it”. Jesus was getting into Edith’s boat. There were other moments that occurred that led her to eventual conversion, similar to the one experienced by Blessed Newman’s or St. Augustine’s – a gradual interior conversion that was accompanied by much intellectual wrestling. This is where I identify with Edith Stein. One day she was staying with friends and to pass the time picked a copy of Teresa of Avila’s autobiography. She spent the whole night reading it and when she put the book down she simply said: That is the truth. She wouldn’t say what about the book impressed her, but like me, it was the galvanizing moment when all the strands came together. After a few days of thinking and praying she went to the local priest and asked to be baptized. When he questioned her readiness, she eagerly asked him to test her. She was received into the Church 1/1/1922. She immediately wanted to join the Carmelites but she was asked to wait. Eleven years later in 1933 she was accepted into the Carmel in Cologne. In 1938 Germany was invaded by the Nazis and eventually the Gestapo came for Edith in 8/2/1942 and took her away with her sister who had also joined the order. During the journey she comforted and helped distraught mothers and their children. She was murdered in Auschwitz in 8/9/1942 in the gas chamber. What we see in a martyr like Edith is not normal courage, but courage elevated and transformed through love. She was willing to give her own life out of love for Christ and His people. 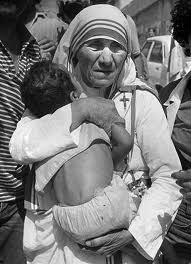 Teresa of Calcutta was born Agnes Gonxha Bojaxhiu on 8/26/1910 in Serbia. At 12 she felt the call to religious life and at 18 enter the Loreto Sisters and took the name sister Mary Teresa of the Child Jesus after the just canonized Thérèse of Lisieux, the Little Flower. After some time in Ireland she sailed for India and saw unbelievable poverty. She worked incessantly in helping the poor to the point of a breakdown. During her recuperation time she felt Jesus’ call to her to serve the poorest of the poor an d to follow Him with reckless abandon. She understood it as a summons to slake the thirst of Jesus for souls. It took a while but she was eventually released from her vows with the Loreto Sisters and allowed to found her own community, the Missionaries of Charity whose mission was to serve the poorest of the poor. Formal approval came from the Vatican in April of 1948. This is something important to understand about the lives of the saints. When a work is of God, people are drawn to it and so many of Mother Teresa’s own students came to join her here in Calcutta. They lived in same poverty as those they served. From this small beginning the order expanded to over 500 missions on six continents. Mother Teresa said if there are poor people on the moon we shall go there too! In time, Mother became a world renowned figure wining the Nobel Peace Prize in 1979 and used her Nobel speech time as a way to decry abortion which she saw as the greatest enemy of peace in contemporary society. She experienced extraordinary closeness to Jesus most of her life but when her order got underway, she experience just the opposite, her unique participation in the suffering of Christ, an aching sense of the Lord’s absence. This darkness lasted for the rest of her life. She felt a terrible pain of loss. She had no joy in her work. She came to understand that her suffering was a sharing in the passion of Jesus, and His feelings as being abandoned by the Father. She entered more deeply into the suffering of those she longed to serve. This experience was not unlike her namesake, Therese of Lisieux who suffered the same type of darkness at the end of her life. Mother Teresa died on 9/5/1997 at age of 87. Temperance is the virtue by which we control our desires for food, drink and pleasure so that we might achieve the demands of justice. Mother Teresa was elevated and transfigured in temperance – a disciplining of the desires that goes beyond the requirement of justice so as to serve the infinite demands of love. The beauty of the church can be found in the tremendous differences it has in its saints: from a towering intellectual as Thomas Aquinas to St. Francis, who wasn’t much of an intellectual at all. There is Joan of Arc, a warrior saint and non-violent saints. This is the glory of what we call the communion of saints. Each one of the four saints in this video segment allows a unique dimension of the Divine Holiness to shine through. Katherine Drexel produced a miracle of transfigured Justice; Edith gave us the clarity of her intellectual work and the beauty of her martyrdom; Thérèse of Lisieux gave us the Little Way; and Mother Theresa brought forth the Missionaries of Charity. The church needs the diversity of the saints to show the infinite intensity of God’s goodness. The saints remind us clearly of our call to purity and holiness of life. They remind us of the necessity of living in faith,hope, and love, and they show us the joy of embracing a life of virtue. • But most importantly, the saints remind us that God has an image of who He wants us to be, and that we should strive with all our might to be that man or woman God has called us to be. • Sacred Scripture tells us that our Lord has created us in His own image and likeness, but our Lord has also created each of us with a certain plan for our lives. In His mind our Lord has an image of the person He wants each of us to be. • Throughout the course of our lives, if we choose to listen to our Lord through prayer, if we choose to follow God’s will, if we endeavor to grow in virtue and seek to make reparation for our sins, we are gradually transformed into that person our Lord has called us to be. • In other words, growing into that person that God has called us to be is simply a matter of growing in holiness. It’s a matter of living out the Beatitudes that we heard in today’s Gospel. • If we manage to live lives of holiness here on earth and become that person that God desires us to be and accept His mercy for the times we have fallen short, then we enter into the joys of Heaven and live united with our Lord for all eternity. • Of course, if we are not sorry for our sins, if we have not asked for God’s mercy, if we have forfeited God’s friendship through mortal sin and have no desire to be united to Him, then we will merit the eternal pains of hell. • But if we fail to realize God’s desire for our life but are still striving for holiness, and if we are sorry for our sins and have asked for our Lord’s mercy, then our Lord allows us to be perfected and made into the image He has of us in the afterlife. And this we call purgatory. • Rather than being a place of punishment, purgatory, my friends, is actually a great sign of God’s mercy. • You see, my friends, God and sin are mutually exclusive; they cannot exist together. So if we are to be eternally united with God in Heaven, then we must be free of all sin and all of our attachment to sin. • If we fall short in our duty to grow in holiness in this life, or if we fail to make proper reparation for our sins, but still love God and desire to be with Him, then our Lord allows us to be purified in purgatory. • This purification will involve suffering (commonly understood as purifying fire), and through this process God’s fiery love “burns” away all impurities on the person’s soul. • And once the process of purification is completed, the soul enters into God’s presence and is fully united to Him. So purgatory is God’s way of preparing us fully to live with Him in Heaven forever. • The saints are the people who have fulfilled that image God has of them during their lives on earth. They are people who have lived a life of holiness to a heroic degree and who have no need of purgatory. • In other words, the saints are people who have proven not only that living a life of holiness is possible in this life, but that holiness is possible for any person living in any circumstance. • In the Book of Revelation, we hear of St. John’s famous vision of heaven, and he tells us about the servants of God who come from every tribe of the children of Israel. • St. John tells us of the great multitude of people standing before the throne of God, from every nation, race, people and tongue, and in doing so St. John tells us that sainthood is not restricted to a certain group or class of people. Sainthood is for all of us! • And the Church’s history has borne this out. While the Church does make distinctions between various classes of saints, such as martyrs, pastors, virgins and religious, the Church’s roll of saints includes both men and women of all ages from every continent. • And today’s feast calls us to be among their number when we die. • The beautiful thing is that the saints not only call us to join them around God’s throne in the eternity of heaven, but through their merits and intercession they actually help us to fulfill God’s will and grow in holiness. • The author of the Letter to the Hebrews speaks of the saints in Heaven as a “great cloud of witnesses,” and he writes: “Therefore, since we are surrounded by so great a cloud of witnesses, let us rid ourselves of every burden and sin that clings to us and persevere in running the race that lies before us while keeping our eyes fixed on Jesus, the leader and perfecter of faith” (Heb 12:1-2). • As we celebrate this great Solemnity of All Saints, as we bask in the glory of this great cloud of witnesses who have gone before us marked with the sign of faith, let us trust in their intercession to help us in whatever struggles life brings to us. • Let us look to their example of heroic virtue and purity of life and seek to imitate it for the sake of our souls. Like the saints in Heaven, let us live out the Beatitudes with faithfulness and integrity so that we may one day join them around God’s throne.